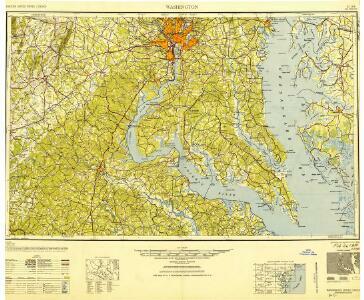 Topographical atlas of Maryland: counties of Calvert, Charles and St. Marys. Balloon View of the Battle-ground between Washington, Manassas Junctn. & Fredericksburg. Balloon View of the Battle-ground between Washington, Manassas Junction & Fredericksburg. This map principally shows the area around the western side of the Potomac River, a region that saw heavy fighting during the war. At the top of the map is Fredericksburg, site of a battle in December 1862, while in the middle of the map, Manassas Junction appears. This was the site of the Battles of Bull Run, the first in July 1861 and the second in August 1862. The Confederate Army named battles after the nearest town, hence calling it the Battle of Manassas. The Union Army named battles after physical features and the map shows the Bull Run River passing close to Manassas Junction. L. Prang & Co.
1 : 126720 Young, J. J.